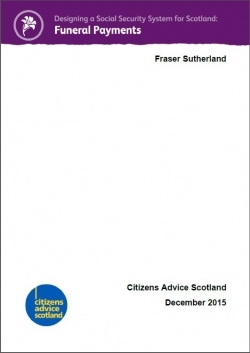 This report outlines recommendations for improvements that could be made to the current system of Funeral Payments, which will be devolved to the Scottish Parliament. Funeral Payments should allow for families who require support to have a dignified but affordable funeral for their loved ones. However, the current system, which is part of the Regulated Social Fund, often fails to meet the needs of those struggling to meet the costs of a funeral. As a result of people struggling to pay funeral costs, CAB across Scotland are helping more people than ever before who find themselves in funeral poverty.